200 miles. 25.5 hours. Ventura->Dana Point. No sleep. 12 friends. One AMAZING time! 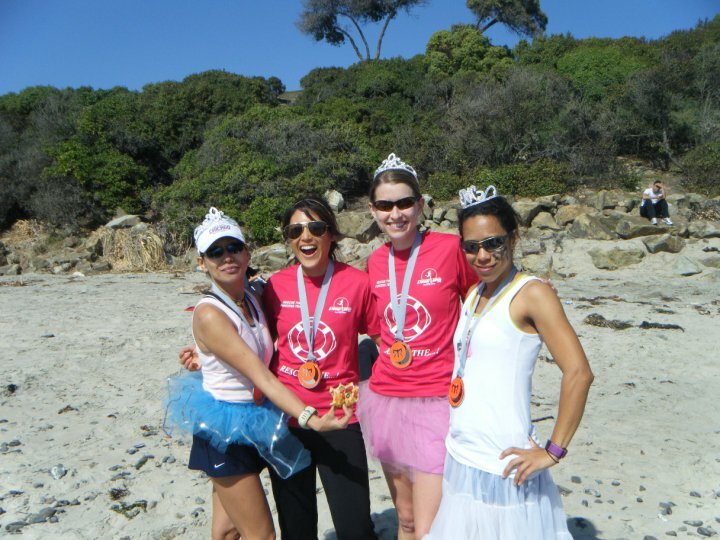 A short description of the Ragnar Relay: PICTURE THIS: Beach Bunnies. Movie Premiers. You and 11 of your closest friends running day and night. 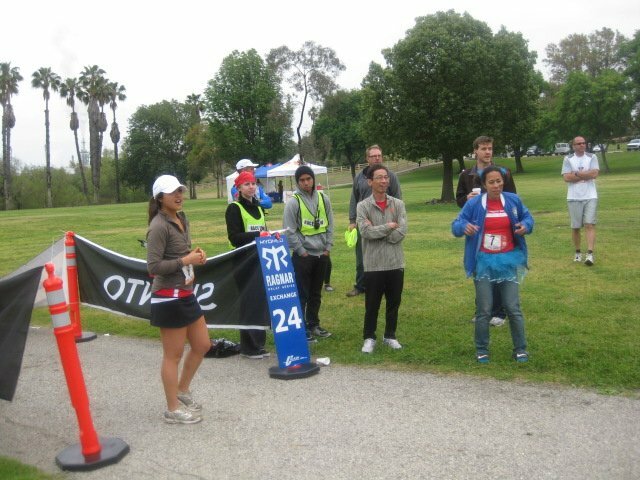 Starting in beautiful Ventura, your team of 12 runners will embark on a 200 mile adventure-fest. The party in your van will only get better as you leap frog your way down the beautiful Pacific Coast. You’ll see stars as you run through Hollywood and feel the ocean-spray as you fly past the “South-Swells” of Huntington Beach. 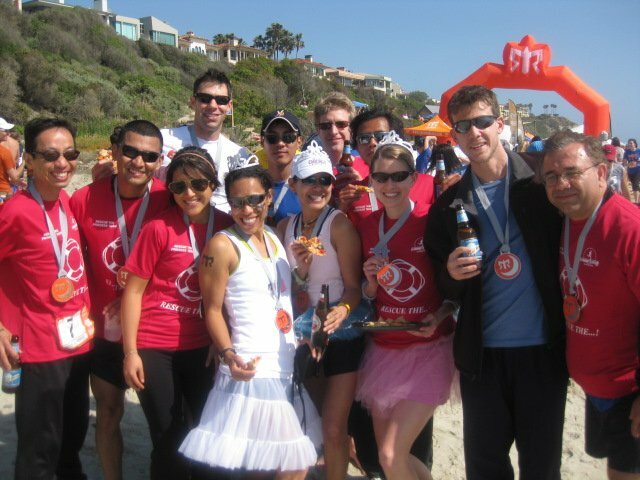 The race (and your stamina) will wrap up where the spectacular bluffs meet the crashing waves of Dana Point. There wasn’t much at the exchange points besides bathrooms and water, but it was fun to hang out with the other van for a little bit. On some legs, we even followed the other van and cheered on our runners. We were famished when we finally got to eat dinner after our first exchange. Note to self: Never eat Mexican food and froyo before an 8 mile run. I didn’t think it would be that big of a deal since we ate around 8pm and I wasn’t expected to run until 1AM, but that froyo sat like a rock in my stomach and I kept burping up fajitas (TMI?). Ugh..not pleasant. I wanted to catch some zzzz’s before my night shift, but couldn’t sleep knowing I had to pound out another 8 miles. 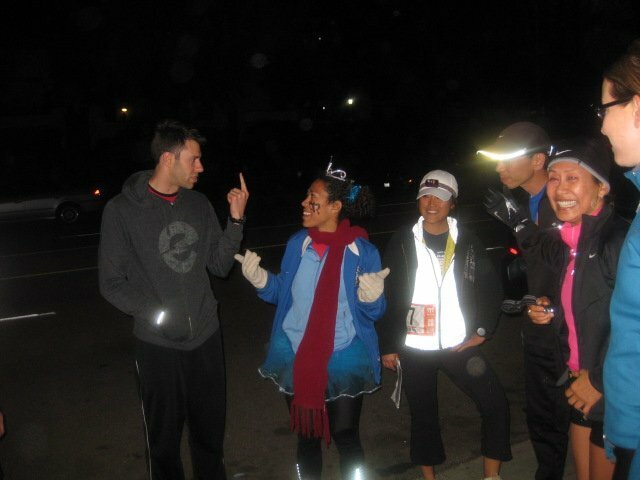 Since I was running in Reseda at 1 in the morning, we thought it might be better if we doubled up for the night shifts, especially when a girl was running. Since the other team was too tired, Gary from our van decided to run with me. He was also running his own leg of 8 miles right after me! Keep in mind, this guy qualified for the Olympics 3 times, so don’t feel too bad for him 😛 But seriously, couldn’t have done it without him. He gets the MVP title for our team. The 8 miles was along a bike path, pretty boring and dark. The nerve pain in my leg that won’t seem to go away crept up again, but I kept pushing through. I had to average at least a 8-8:30 min/mile in order for us to stay on track. Gary kept me entertained which made the run a bit easier, but I could clearly tell I was running differently with more weight placed on my good leg. I was so glad to be done with my long legs and relax for a little bit. We made it through our van before we met up with the second van at the Santa Monica Pier, around 4AM. By this time, I was on the verge of delirium. Keep in mind, my usual bedtime is 10PM. Reflective vest? Check. Headlamp? Check. Tail light? Check. We hung out on the pier for a little bit before heading to our next change spot, Wilmington, Torrance. We parked our van there and crashed for a little bit before the team rolled on through. I probably got about 1-1.5 hours of sleep in between and when I woke up, I was so surprised to see the parking lot full of vans! We had been running this race with only a few other teams and this gave us good news that we were catching up to other teams. Groggy and sleepy-eyed, I tried my best to get through this last leg. It was only 2.5 miles at 7AM, so I wasn’t too worried. Once our runner came through, I took off. Running through Wilmington and Harbor City is umm..not nice, but they had race officials along the streets so I didn’t feel too uncomfortable. I was hoping to average a 7:30 mile, but my leg started up again and was worse this time. Having to stop at the red lights only intensified the pain and by the end I was limping really badly. I had planned to run the next leg with my friend, another 3.5 miles, but I couldn’t fathom running another step. We scrambled into our vans and went though another round. By this time, we were running on pure adrenaline and coffee. 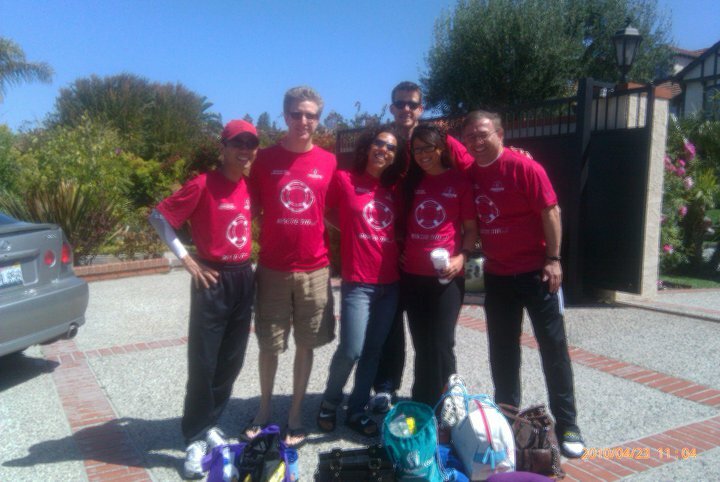 We met up with Van 2 at Huntington Beach where I decided to jump in Van 2 and help them drive and navigate. This was our final circuit of runners and we were catching up to a lot of teams. Us girls definitely “chicked” a couple guys out there. Our team captain was our final runner and even though we were 1.5 hrs behind schedule, we had a pretty good feeling about the results. 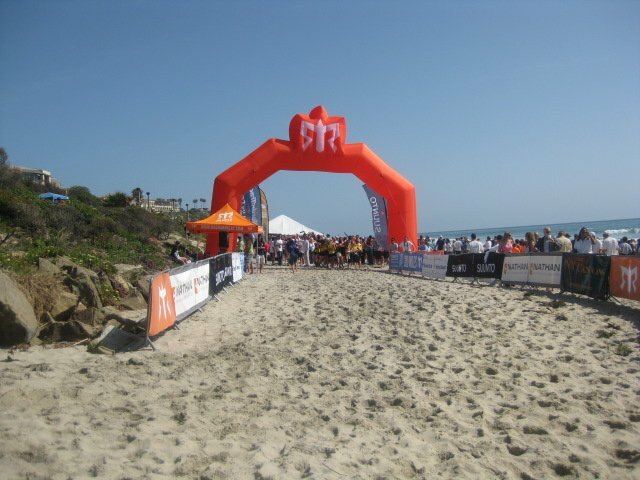 The finish was down by the beach in beautiful Dana Point. 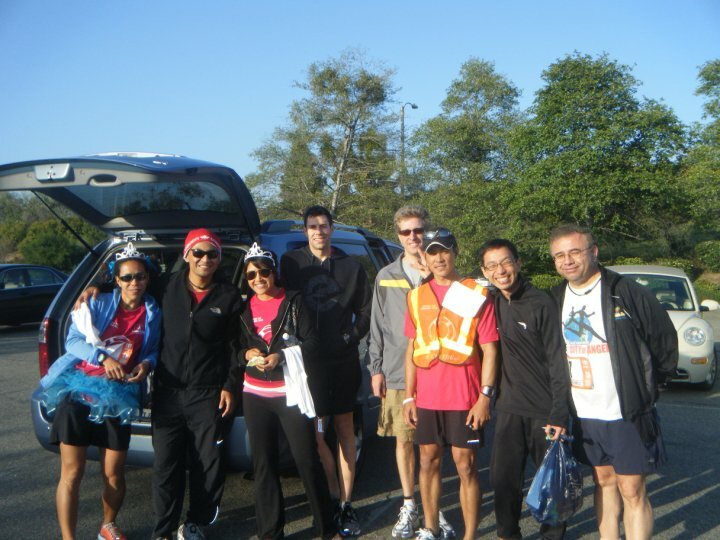 Once we saw Ron, our team captain, sprinting down the trail path, we all joined in a ran through the finish. 25.5 hours later, we had covered 200 miles! This experience was so much fun and even with the lack of sleep, I will gladly do it all over again. We placed 5th overall and 2nd in our division. Not too shabby! Next year: Mt. Hood to Coast in Oregon! just found your blog via caitlin’s “plug your blog” post – always great to see another los angeles area food blogger!! !